Uno Dos Tres - Counting in Spanish up in this Place! You are here: Home / Family / Education / Uno Dos Tres – We’re Counting in Spanish up in this Place! It’s Bonus Friday at Kandy Apple Mama, and today, we’re sharing some fun games to teach your little ones how to count in a foreign language! My husband Kevin and I spent our honeymoon in Dominican Republic a few weeks ago. It rained our first couple of days there, so we participated in the resort’s hosted activities indoors. Now don’t get too intimidated, but you are looking at the Undefeated Spanish Bingo Champion. Playing bingo in another language requires the ability to effectively hear and understand the foreign language, translate numbers quickly, and still function without getting lost in thought. I LOVED IT! I immediately texted Amanda and told her we had to include Spanish lessons in our Beyond the Classroom series. She was totally on-board, and here we are! Welcome! Bienvenidos! I learned my numbers in Spanish when I was in Montessori school, so I was probably 3 or 4 years old. They simply put the numbers on the wall and had us all recite them in Spanish. While effective, not entertaining. I’m determined to raise a brilliant child, so she needs to be a logical thinker, an eloquent speaker, and well-rounded in her knowledge. While I wish I could teach her Mandarin, I only ever learned Spanish (I can carry on a decent conversation) and enough spoken colloquial Arabic to exchange pleasantries. (I’d have to seriously brush up on my Arabic before I could teach her anything.) Besides, we’re in Texas, so it makes sense she would learn Spanish first. 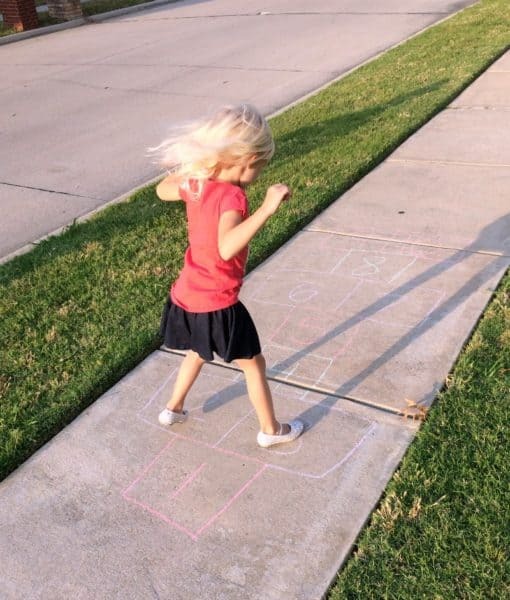 The challenge is to teach her in a way that she doesn’t realize she’s learning because she’s having so much fun. I’ve come up with a few pretty good ideas for how to accomplish that goal. My first game for you is so simple you’ll think I must be joking when I tell you that my daughter mastered her Spanish numbers 1 through 25 with it. We have a long stretch of sidewalk to the side of our house (one of the many benefits of owning a corner house!) 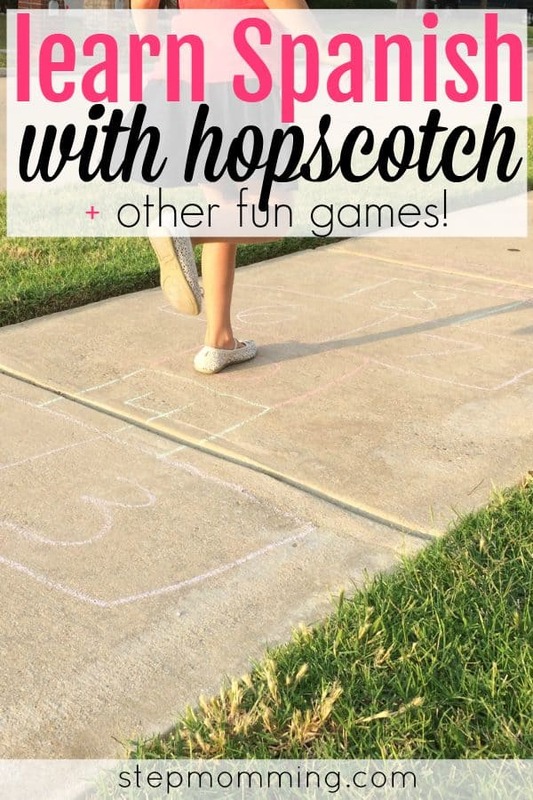 which is prime real estate for a hopscotch game. When we want to play, we write all numbers 1-25. We want to practice them all, but often we only work on a stretch at a time: 1-10, 10-20, 15-25, etc. As she hops to the next number, she has to say the number in Spanish. I totally understand – you think it’s too simple! But my fun-loving 7-year-old loves it! Taking a page from the Dominican resort handbook, I’m going to recommend you play Bingo en Espanol! You can get a really great set on Amazon pretty cheap, and it’ll last you for years! This is a wonderful way to really master numbers in Spanish while still having fun as a family! Even if you repeat the numbers a few seconds later in English when you announce what was drawn, it will really help your kiddos to learn to start translating the numbers in their heads. You might be thinking “What if I mess up and say the wrong number? 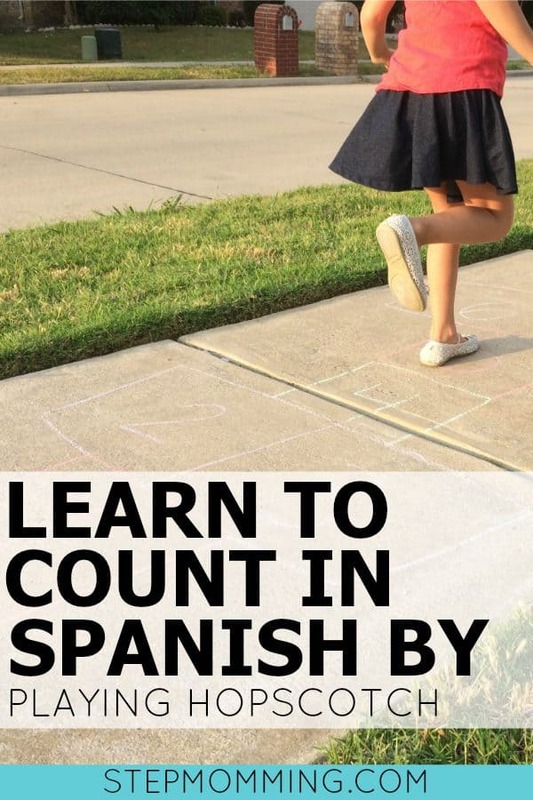 What if I can’t remember the Spanish numbers myself?” … Have no fear, Mama! We’ve created a Spanish numbers guide for you to reference in case you forget! Subscribe to Get Your FREE Spanish Numbers Cheat Sheet! Exclusive for Stepmomming subscribers, a FREE Spanish numbers cheat sheet sent directly to your inbox! In fact, when you subscribe, you’ll get access to ALL of our freebies! I’ve given you two concrete examples for counting in Spanish, but you could get really creative with some of the other math games we’ve shared with you. Could your child practice his Spanish numbers and subtraction with the bowling game? What if you played Beach Ball Madness in Spanish? I know you’d have a ton of fun playing Foreign Language Flashcard Lava Pit. The opportunities are endless. You have the list, you have the ideas, and you have a brilliant mind just waiting to learn. Go for it! You’ve made so happy today and you’ve restored my faith in humanity (I’m not exaggerating). As a child of divorce, it makes me really glad to see that a mom and stepmom can actually work together without any resentment. I fricking love this! I also grew up as a child of divorce and want to ensure my stepdaughter doesn't have to go through any of that same unnecessary pain you and I went through!